Despite the shock and dismay from the presidential election, we cling to the knowledge that the Goddess still rises. In fact, the female archetype is about the only thing that can save us now. 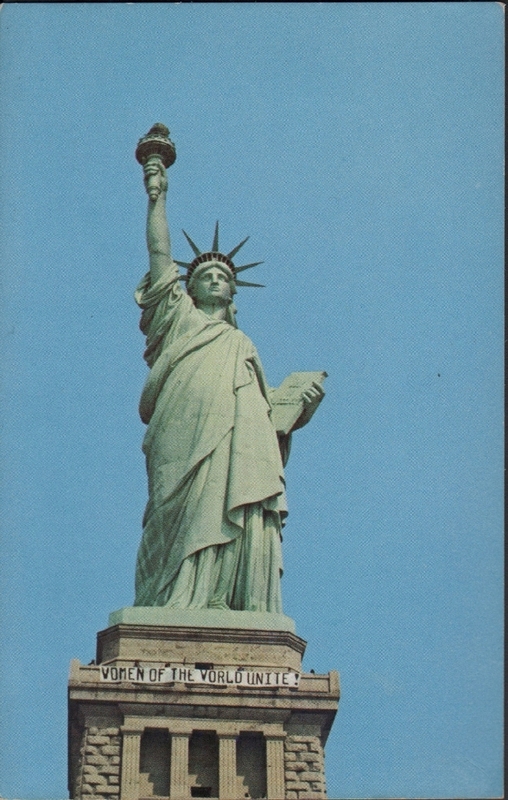 The female divine is at the very root of the founding of this nation, and one look at the green lady in the New York Harbor with her torch held high tells us that the female divine is what lights the way to a brighter future as well. Focus on these symbols. Remember that symbols are the only way to communicate with the subconscious, where true change occurs. Words and language and facts don’t matter to the subconscious, images do. What attracted us to study the suffragists of the early 20th century was their successful use of symbolism to convince the reluctant majority to join their radical cause. They chose symbols for themselves that fit right into the American tradition, thus subconsciously comforting those afraid of change. Since the founding of our Republic, Americans have used the allegorical female to convey messages of so-called WOMEN’s strengths — strengths such as caregiving, caution, protection of the young, and enlightenment. 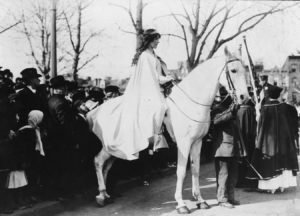 The photo below left from the 1913 suffrage parade in Washington DC shows Inez Milholland dressed as the Herald, an allegorical female that became the logo for the National Women’s Party. Look her up – Inez Milholland — she has a fascinating story, and we all should have learned about her in history class. 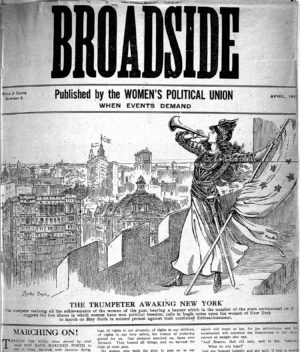 The Broadside (above, right) is from Harriot Stanton Blatch’s organization, and shows the Herald awakening New York City. 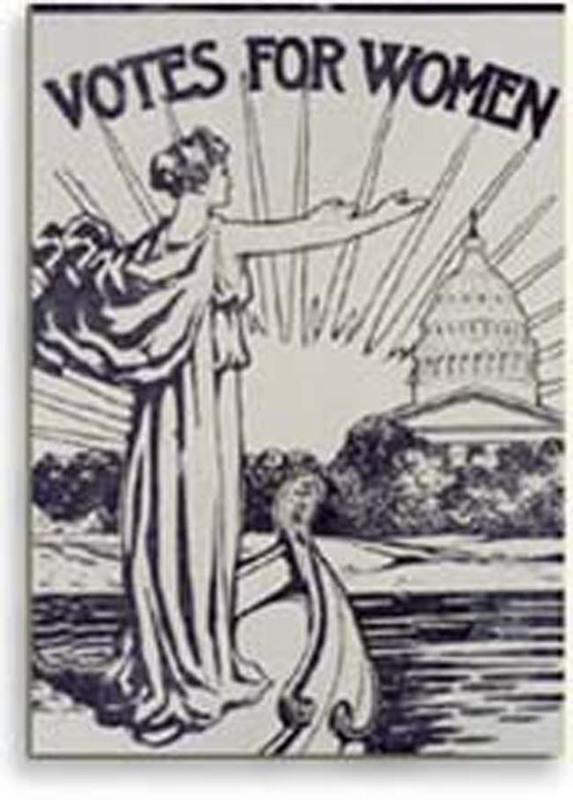 The allegorical female symbol gave the suffrage movement a link to the past and a sense of authority. To the right is another activist woman, this time dressed specifically as the Statue of Liberty, at another suffrage parade in St. Louis in 1916. The newspaper identified her only as as “Mrs. David O’Neil”, so we don’t even know her own name. This practice of referring to married women as an extension of their husband’s property was one of the social norms that the second wave of the women’s movement demanded be changed. 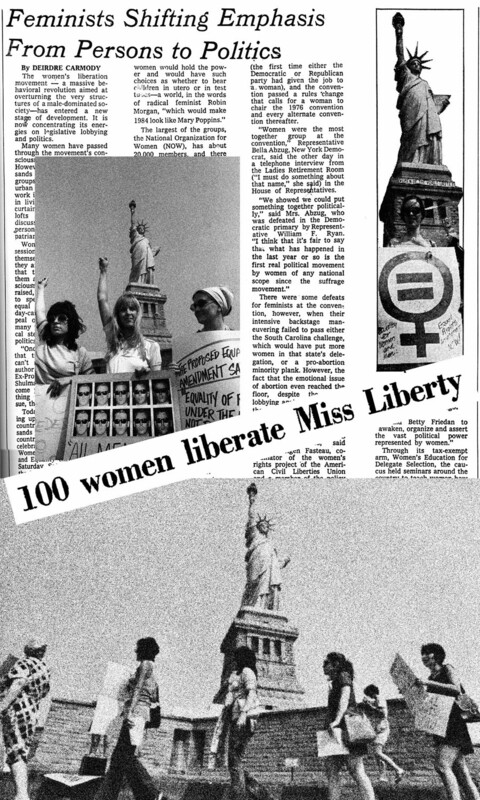 Here they are (right) taking over of the Statue of Liberty in August of 1970 in order to draw attention to the Women’s Strike for Equality organized in honor of the 50th anniversary of the passage of the 19th amendment. 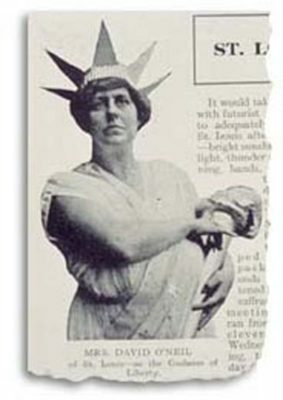 That day, these activist women saw Lady Liberty as a powerful female on their side. See the 40-foot banner hung here on her pedestal that says “Women of the World Unite”. The other banner gave the time and place for the march down Fifth Avenue, and the media coverage at the Statue of Liberty brought out 5,000 marchers two weeks later. Rebranding the Statue of Liberty as our American Goddess – and acknowledging the divine female as part of the American tradition – led us to the conclusion that liberty for real women is the key to humanity’s survival on this planet, and we mean that quite literally. As this new administration begins to roll back advances in gender equality made in the last few decades, we want you to focus on the Statue of Liberty, particularly the strength of the goddess energy inside her, which is also inside all of us. 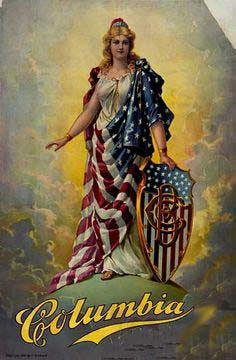 The more we can identify with the American Goddess, the more we will feel impelled toward cooperation and partnership.